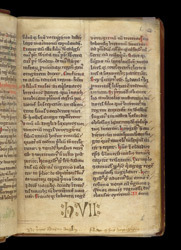 This is the unique manuscript of the Chronicle of Henry Sulgrave (or de Silegrave), who was presumably a monk of the Benedictine priory of the Virgin Mary and St. Martin, Dover, in the second half of the 13th century. It must have been composed after 1274, because it includes the coronation of King Edward I by Archbishop Robert Kilwardby, which took place in that year, and probably before 1292, as it has a list of archbishops of Canterbury up to and including John Pecham, who died in that year, but not his successor. In the lower margin of the second leaf of the text, is the pressmark 'H VII' of Dover priory.